Here is a guide to help you understand what you need to get the best showering experience for all your needs. Quadrant showers are designed to be fitted into a corner with a curved shower tray making them ideal for smaller bathrooms. With a curved radius facing into the room, they can give a modern or tradition look to your bathroom while saving you valuable space. Quadrant showers can be installed with hinged doors, but to save even more crucial space in a smaller bathroom sliding doors can be installed ensuring that there is no room taken up in your bathroom by a door swinging out. Resembling Quadrant showers, Offset Quadrant are also based to fit into the corner of your bathroom; Offset Quadrant showers unlike Quadrant have one longer straight side in the corner of the room allowing for a more greater showering space. Walk in showers are the perfect option for a stylish doorless solution, which allows for a free flowing feel into room. 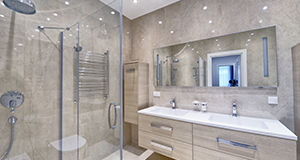 Walk in showers and generally constructed of one or several pieces of fixed glass, with the option of having a frame, or being semi or entirely frameless. Walk in showers generally have a rectangular tray, but can also come with quadrant and offset quadrant trays. With the minimalistic design cleaning and maintenance are done at ease. 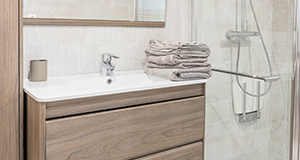 Similar to walk in showers, wet rooms allow for a modern doorless solution; unlike walk in showers where a shower tray is used a wet room’s floor is designed to slope towards the shower drain, requiring waterproofing of the floor and room. Wet rooms are an attractive showering solution that fits into almost any bathroom as with no predefined shape it can be designed to fit your bathroom perfectly. The design also allows you to create a larger open space. 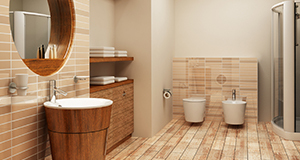 Wet rooms can be used to fit into a bathroom, or in fact can be used for a dedicated shower room. 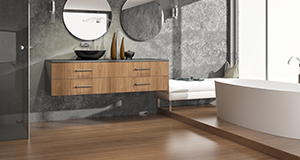 Although wet rooms allow for the most modern, free flowing design, they are the most difficult to install. This is due to installation requiring waterproofing of the room, and creating a floor with a steady gradient down into the drain. Hinged doors are a swing door design that offers pure simplicity that can fit into any bathroom design. The hinges fasten to glass door, which can be frameless, semi-frameless or framed. Pivot doors allow for an easy smooth swinging motion as part of the door swings on the axis into the shower, and the other larger side swinging into the room. Often the most cost effective solution to shower doors, but an easy door solution to rooms with limited space. Bi-fold doors fold in the middle, using a hinge, into the shower allowing for an easy opening solution that takes up minimal space. Bi-fold doors can be either framed or semi-frameless. 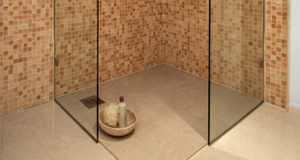 Sliding doors are the ultimate shower solution for doors. Sliding into the shower they take up the least room, and give the most modern feel to your shower enclosure. For smaller shower enclosures though this solution may not always be possible with the door needing a large enough room to slide open.